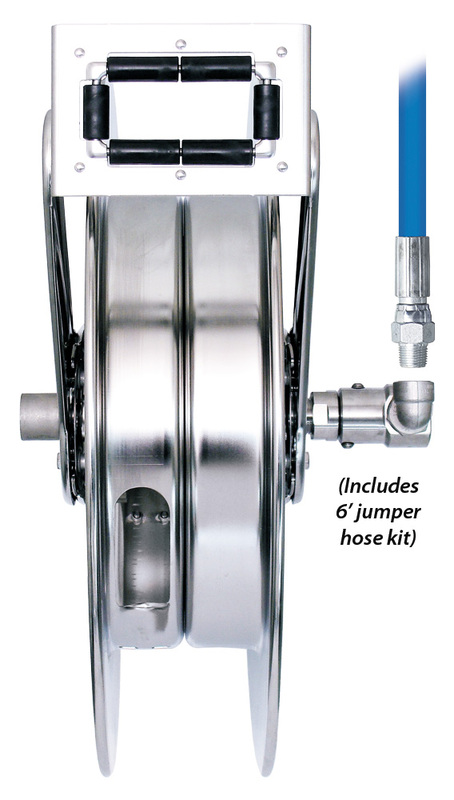 Hose Reel, SS, 1/2" x 75', 1500 PSI, With Jumper Hose Kit | Lafferty Equipment Manufacturing, Inc. This professional-grade, heavy-duty hose reel will accommodate a 1/2" ID hose up to 75 feet (1500 PSI maximum water/solution pressure). A multi-position, locking, ratchet mechanism secures the hose at the desired length and spring assisted retraction takes the effort out of coiling heavy hoses. Stainless steel construction offers non-corrosive performance in demanding industries. Adjustable guide arm allows for various mounting options: wall, floor, ceiling, vehicle, etc.